"I am tired of fighting.... from where the sun now stands, I will fight no more." 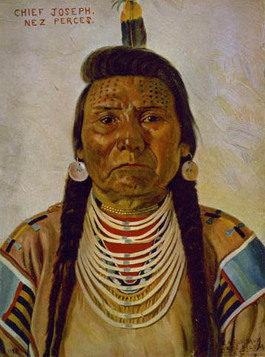 A punitive government, which was determined to subdue in soul and spirit the proud Nez Perce, had Chief Joseph and his people sent to Fort Leavenworth as prisoners of war following Joseph's surrender at the Bear Paw Battle. What followed, was an American Tragedy from which America can take little solace or pride. 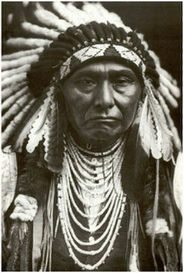 On November 23, 1877, the Nez Perce arrived at Fort Leavenworth where they would remain until the following summer. There in the squalor of a malaria-infested camp, over 21 of the Nez Perce patriots would die of malaria as a callous government stood idly by. Indignation by some government officials began to turn humanitarian wheels slowly. In July of 1878, the Department of the Interior requested the War Department to deliver the prisoners to its jurisdiction. A short time later, the Nez Perce were loaded on a train and taken to Baxter Springs. By October, 47 more Nez Perce had died. From there, the Nez Perce were relocated to Fort Oakland, on the original Tonkawa Reserve in Northern Oklahoma. In time, men of conscience became aroused in part through the efforts of Chief Joseph, and the Nez Perce were returned to Idaho and Washington.In May, 1883, the War Department approved a proposal by the Indian Bureau to return 29 Nez Perce to Idaho. By 1884, the number of survivors had dwindled to 282 from the original number of 431 who had surrendered with Joseph. Finally, in the spring of 1885, the surviving Nez Perce prisoners were returned to Idaho and Colville. Joseph was not allowed to return to his beloved Idaho and continued to be treated as a prisoner of war and instead was sent to Colville along with many other Non-Christian Nez Perce. From Colville, Joseph, as a Political Prisoner of War, would continue his struggle for justice for his people and the return of their ancestral lands until his death on September 21,1904.